Shivraj Chouhan sought to help onion farmers by purchasing excess onion, but the move backfired. How? Rise in onion prices is believed to have been the chief cause of the defeat of Atal Bihari Vajpayee's NDA regime. Onions prices troubled the Manmohan Singh government as well. Now, onions are giving tears to the Shivraj Singh Chouhan government. Onion price is a perennial issue in Madhya Pradesh. Last year, the state was forced to sell onions through Markfed when onion rates soared. This year, it is facing a different challenge. The government is, in a way, paying for its magnanimity. In a move to help onion farmers, the government announced to buy onions at Rs 6 per kg from them. However, no arrangements were made for storing the procured onion. As a result, the onion is now rotting in state warehouses. According to estimates, 1.30 lakh quintal onion has gone wasted, costing the state exchequer over Rs 10 crore. To make matters worse, at least Rs 75 lakh has been spent to dispose the rotten onion. The government tried to auction off surplus onion but found no takers even at a price of Rs 4 a kg, leaving it in the lurch. Madhya Pradesh has reaped a bumper onion crop this year, but doesn't have enough storage facilities. Small and medium scale farmers have few options for storing the additional harvest; most of them are entirely dependent on the market. The market was flooded with onion this season, leading to a sharp decline in prices, at time below Re 1 per kg. The farmers were thus forced to dump their produce wherever they could. It was then that the state decided to intervene in favour of the farmers. The chief minister declared to buy onions from the farmers. 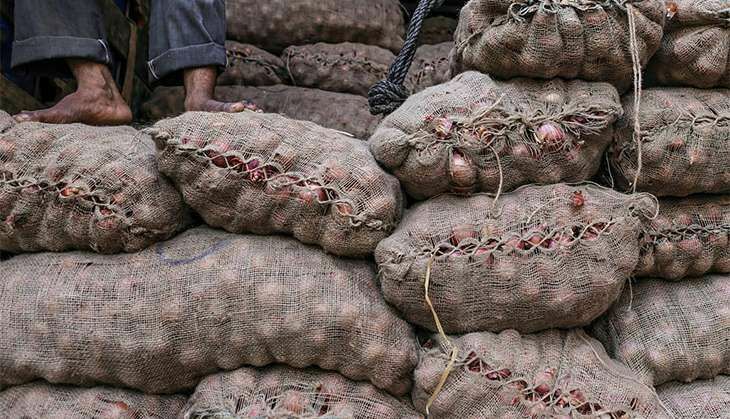 Nearly 10.5 lakh metric tonnes of onion was procured for about Rs 60 crore. The government's decision to buy onion at Rs 6 per kg had its effect on the market, where prices surged from Re 1 per kg to Rs 7-8. The state, however, failed to make proper arrangements for storing the onion. Ramnivas Rawat, the Congress Chief Whip in the state assembly, alleges this was because the government "acted in haste without formulating a strategy". "They simply left the onion to rot in godowns. It didn't make arrangements for proper storage," he adds. Only when the onion started to rot with the onset of the rainy season did the government hit the panic button. Tenders were invited from traders to buy this produce, but nobody offered a price of more than Rs 2 per kg. Finally, the government was compelled to sell the onion in the retail market at Rs 4 per kg. Anybody can buy a minimum of 10 kg onion at this rate from state warehouses. There is no maximum limit for the purchase. The government claims to have sold 7.5 thousand quintal of onion this way, but the actual quantity sold might be a lot less. "We're selling the onion. The buyers are coming for it. But it's a difficult job," admits the minister Vishwas Sarang. The government's woes do not end there. It still owes Rs 37 crore to the farmers it bought the onion from. Only Rs 15 crore had been allocated from the supplementary budget for this purpose; nobody knows where the rest of Rs 22 crore would come from. Vishwas Sarang, on his part, says the government will borrowing money to pay the farmers. "We will try to pay the dues within a week," he insists. As things stand, fulfilling this promise won't be easy. READ NEXT >> If CID warned of a threat to Gandhi's life, why didn't govt protect him?